The canvas is simple: tubular meat, squishy bun, maybe a squirt of mustard. 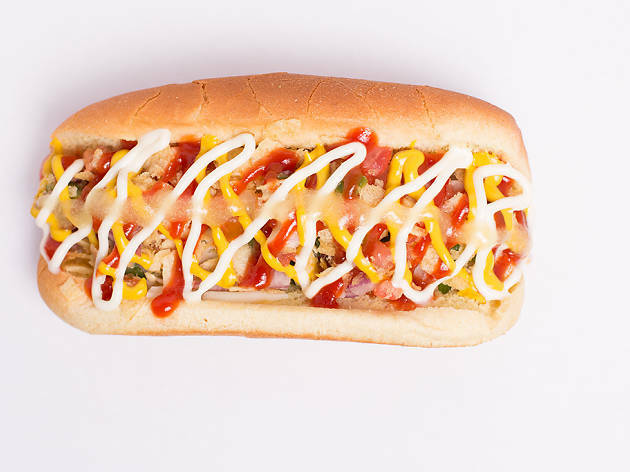 But when that simple combination is done right, a hot dog becomes more than the sum of its parts, a meal that’s simultaneously low brow and divine. 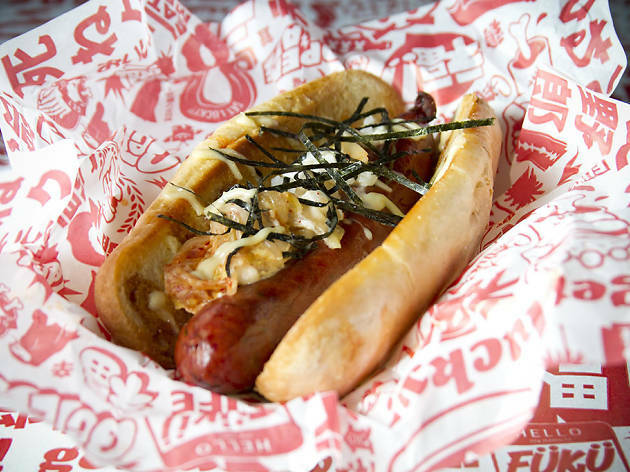 Just like the best sushi in Las Vegas, the best hot dogs in Las Vegas come in all shapes and sizes: from sausages topped with relish, ketchup, mayo and mustard to classic franks, wieners and wurstels. Sure, you might find some delicious variation of the food at the best buffets in America, but there is something about each one of the hot dogs below that makes it truly top-notch. 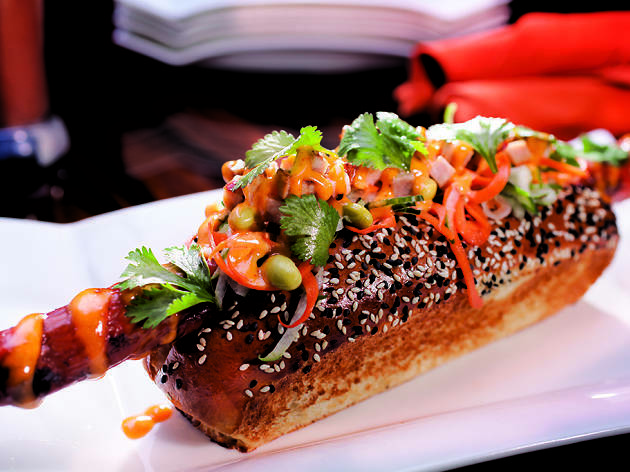 And, remember, no sausage experience is complete without a cold beer in hand (here are the best places to drink craft beer in Las Vegas… You’re welcome). 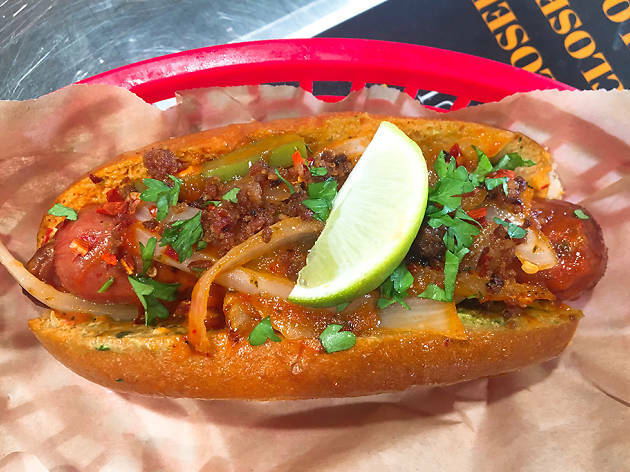 Gourmet hot dog may sound like an oxymoron, but that’s what’s for dinner at this Korean-inspired joint where the menu boasts 19 different options and taps toppings as diverse as pork belly and pico de gallo. 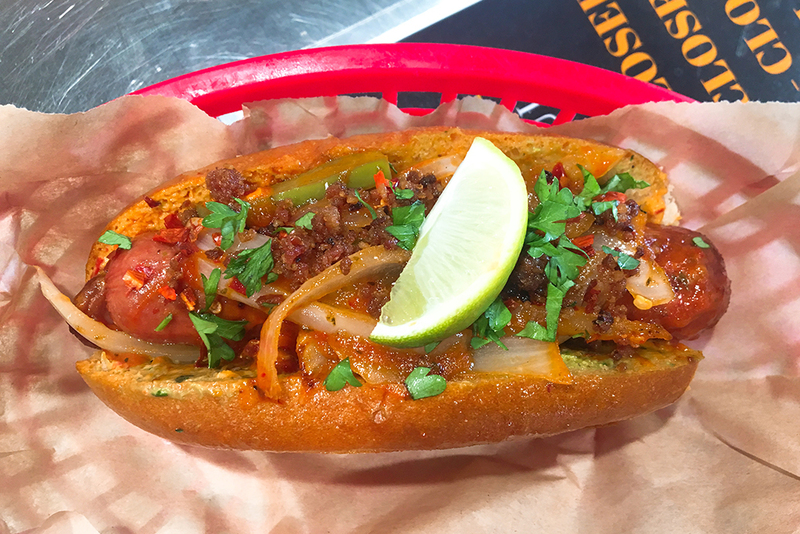 If you like things spicy, you won’t be mad at the Angry Dog, a fiercely tasty frank that comes piled with spicy pork bulgogi, Asian slaw, jalapeño and spicy mayo. Want even more? Pair it with Angry Kimchi sweet potato fries smothered in five cheeses, onions, kimchi and jalapeños and topped with more bulgogi and a fried egg. Damn. When the food truck boom hit Las Vegas, Fukuburger was leading the pack with its bright red ride, Asian-inspired hamburgers and street party vibe. 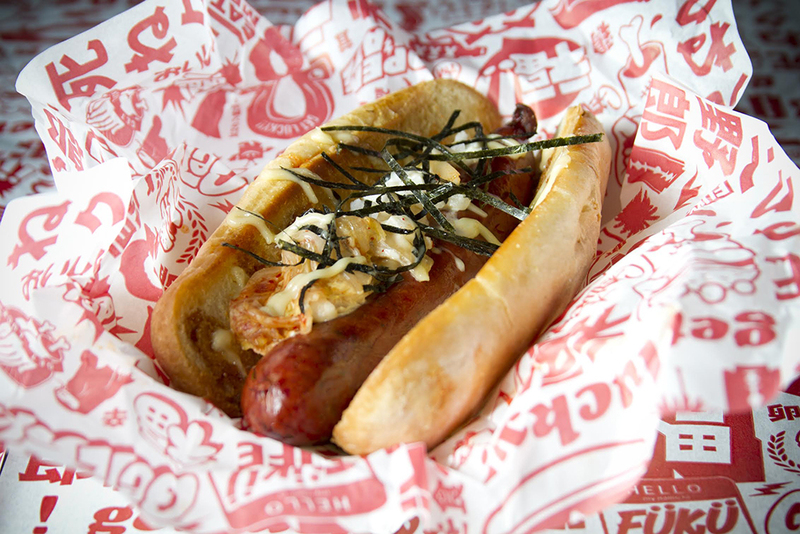 While the namesake burgers are true flavor bombs, the Nagadog quickly emerged as a dark-horse contender for best order with its 1/3-pound hot link laden with grilled kimchee, daikon relish, wasabi mayo and strips of nori. If that sounds like a lot of bold tastes riding in the same bun, well, it is. But trust us, it totally works. Once a humble hot dog cart, today Cheffini’s slings beef, turkey and vegan franks to the downtown crowds from a post inside the Container Park. “More is more” is the philosophy at this wiener stand, where the so-called Naked dog comes with two toppings and sauces and the Classic Cheffini’s is loaded with onions, tomatoes, jalapeño, mozzarella, crushed potato chips, pineapple sauce and—deep breath—mayo, mustard and ketchup. Still hungry? 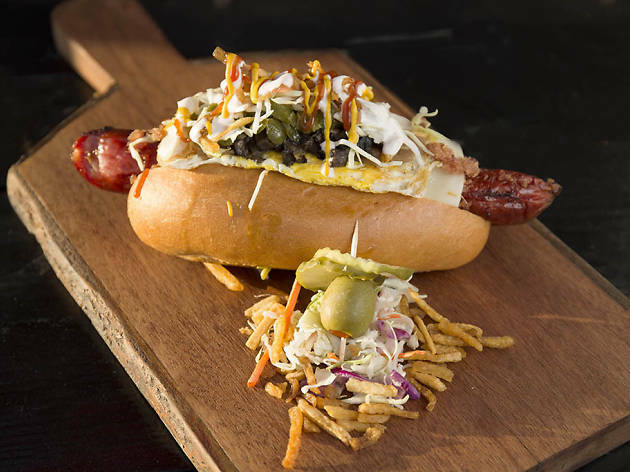 Throw your cholesterol to the wind and order a plate of Latin American favorite salchipapas, deep-fried hot dog slices served over French fries and doused in signature sauce. 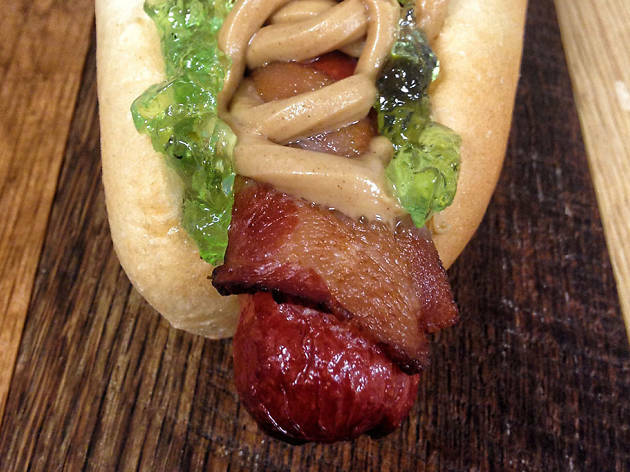 Check your diet at the door of this Los Angeles import, which specializes in bacon-wrapped hot dogs and deep-fried desserts. 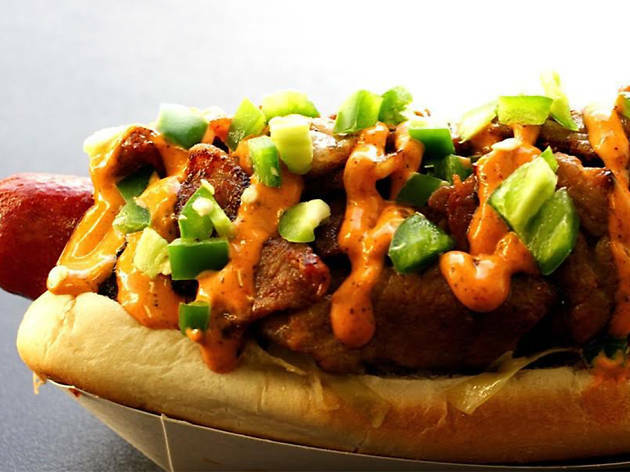 While the official lineup has a scant five franks, those in the know go off-menu with the Mutt, a combination of the Red Dog (spicy tomato chili sauce, chipotle aioli and onions) and the Green Dog (chimichurri sauce, guacamole and cilantro) that packs a flavorful wallop. Try to save room for an order of the dirty corn or some deep-fried Oreos for dessert. Old dogs and new tricks is the theme at this Henderson shop and the PBB&JJ definitely falls into the latter category. 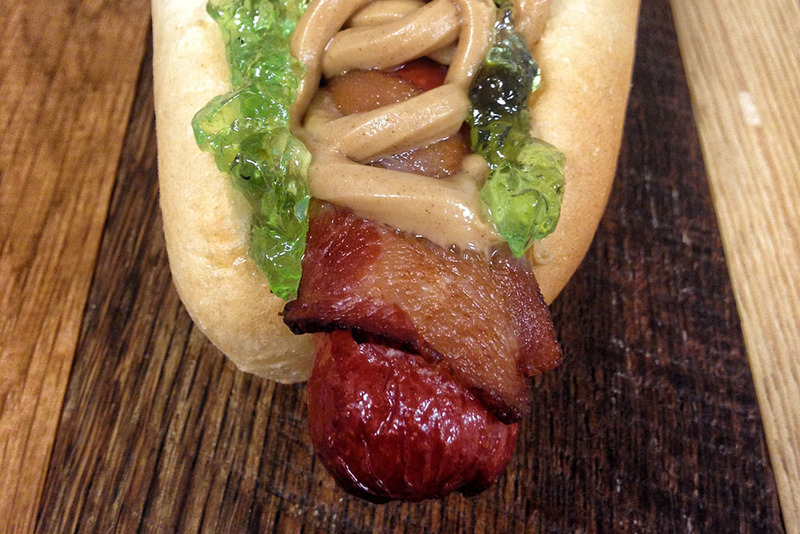 The PBB stands for peanut butter and bacon, as in a bacon-wrapped Nathan’s frank topped with creamy peanut butter, and the JJ stands for jalapeño jelly, as in the perfect foil to that salty, meaty melange. Think you can do better? 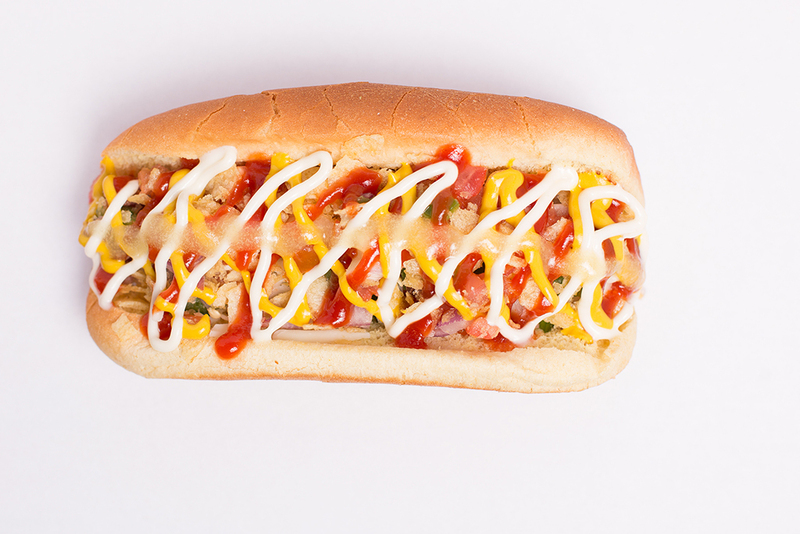 Build your own decadent dog starting with the frank of your choice and then picking from dozens of toppings. We won’t judge if you add some totchos on the side. Love him or loathe him, Gordon Ramsay knows a thing or two about making food you want to eat. Exhibit A: Gordon Ramsay BurGR, where the menu is full of high-calorie temptations, from the Pork Belly “Hot Pockets,” to the Uber Cheese Burger and the Sticky Toffee Pudding Push Up Pops. Hell, even the quinoa salad sounds delicious. 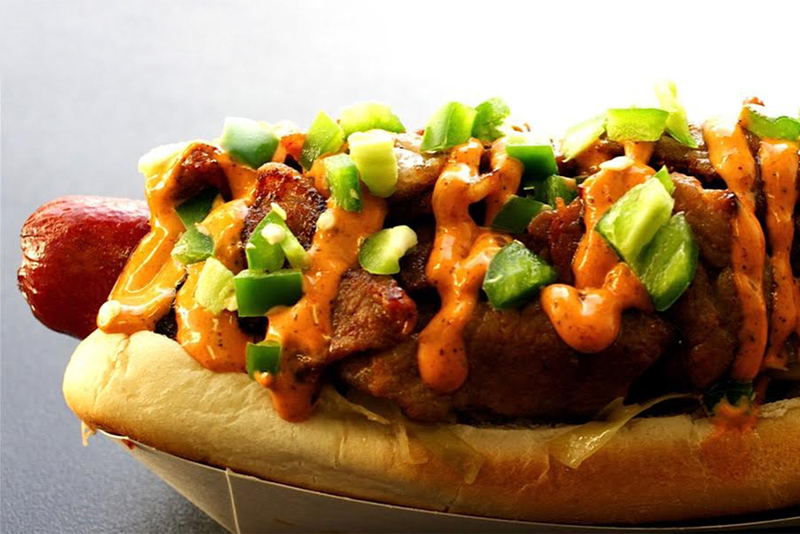 And hidden at the bottom of the menu you’ll find the chef’s take on a chili dog: an all-beef frank simmered in hellfire sauce and grilled then smothered in roasted Fresno peppers, jalapeños, cheddar, avocado, onions and chipotle ketchup. Be sure to order a milkshake for when your mouth needs a break. 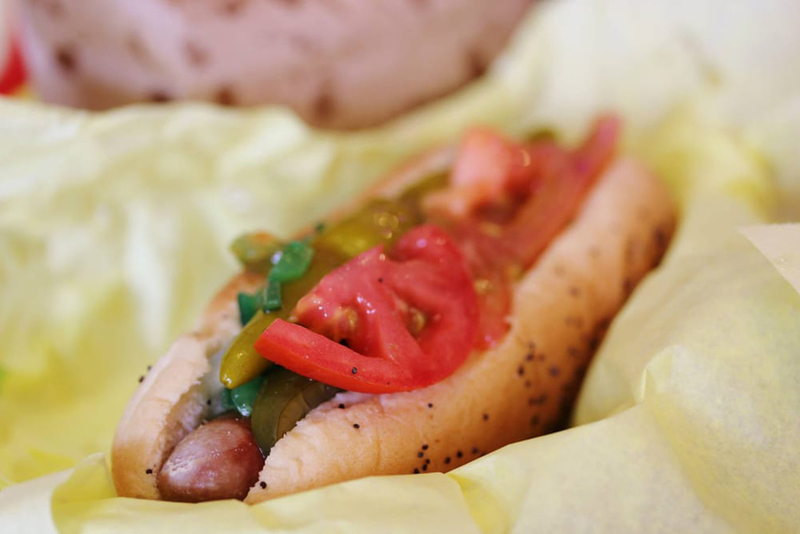 This entry into the race for Vegas’ best falls into the classic category, adhering to the strict specifications that make a frank worthy of bearing the name Chicago. For starters, a Vienna beef hot dog cradled in a steamed poppy seed bun. Then come the accoutrements: yellow mustard, diced onions, relish, tomato slices, a kosher pickle spear, zingy sport peppers and a sprinkling of celery salt. Whether you grew up on these or are just discovering them now, there’s something magical about this combo of tubular meat and toppings that stands the test of time. The latest tenant to fill the literal shack (or perhaps kiosk) in the Dino’s parking lot, Pepito earns its money turning out two-hander burgers, open-faced sandwiches and hot dogs that literally overflow with goodness. 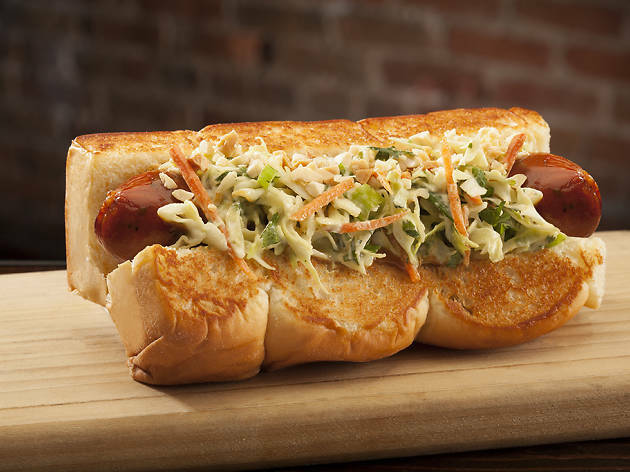 Order up the Scooby Dog, an eight-inch beef frank on a lobster roll piled high with sauteed jalapeños, mushrooms and onions; potato strings; cole slaw greens; bacon; cheese; egg; avocado and two homemade sauces. Grab some extra napkins. You’ll need ‘em. Las Vegas’ mobster past—and whether the city was better when made men ran the joint—is a popular topic of debate in town. 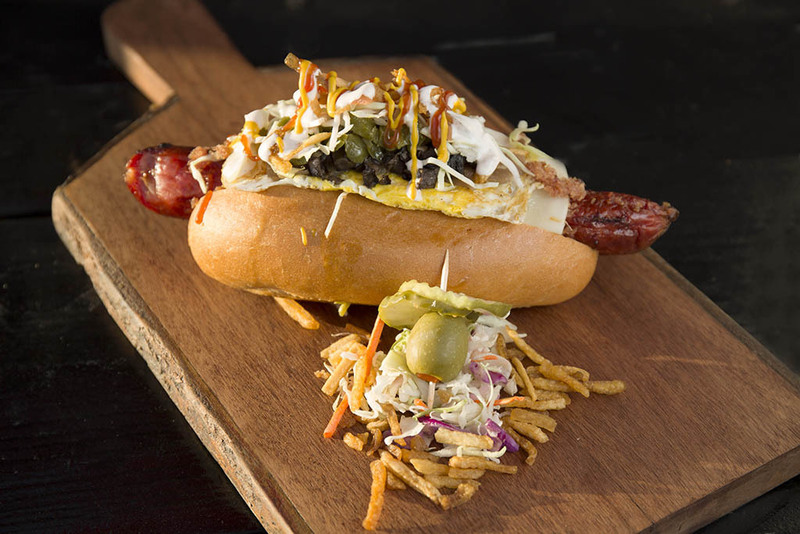 There’s even a museum dedicated to organized crime and the lawmen who fought it, so it’s fitting for the city to also boast a killer Mafia-inspired hot dog. 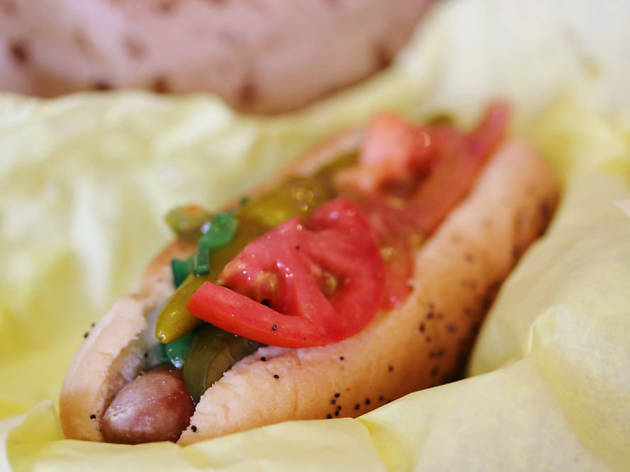 Great Links offers 18 styles of franks as well as numerous sausages from Polish kielbasa to Portuguese linguica. 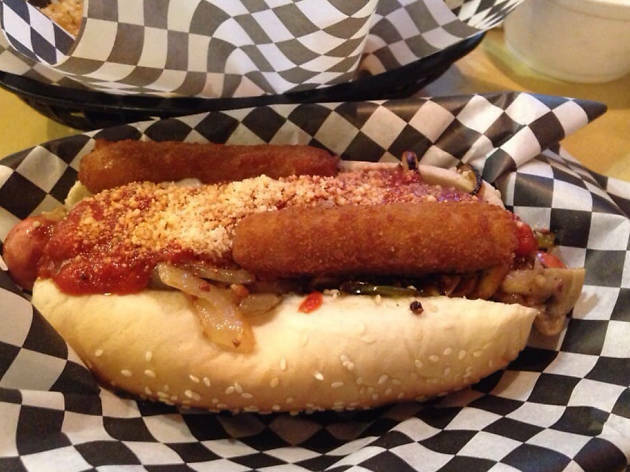 Tempting though they may be, you’re getting the Mob Boss, an all-beef dog with a satisfying snap topped with grilled onions, peppers and mushrooms, doused in marinara sauce and Parm and crowned with a pair of mozzarella sticks. So gangster. 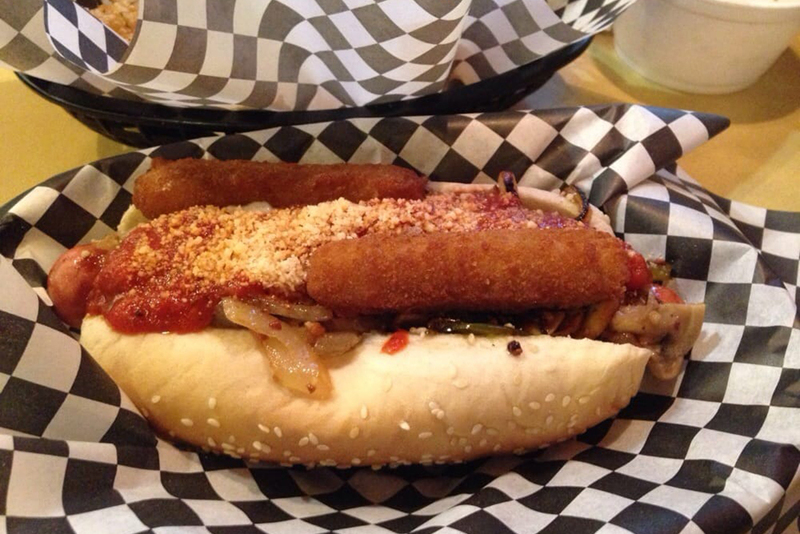 If you haven’t yet sampled Dog Haus, “the absolute würst,” that won't be the case for long. The California-based chain is on an expansion kick and now has locations in five states with 12 more (for a grand total of 450 restaurants) on the way soon. What to order when you get in the door? 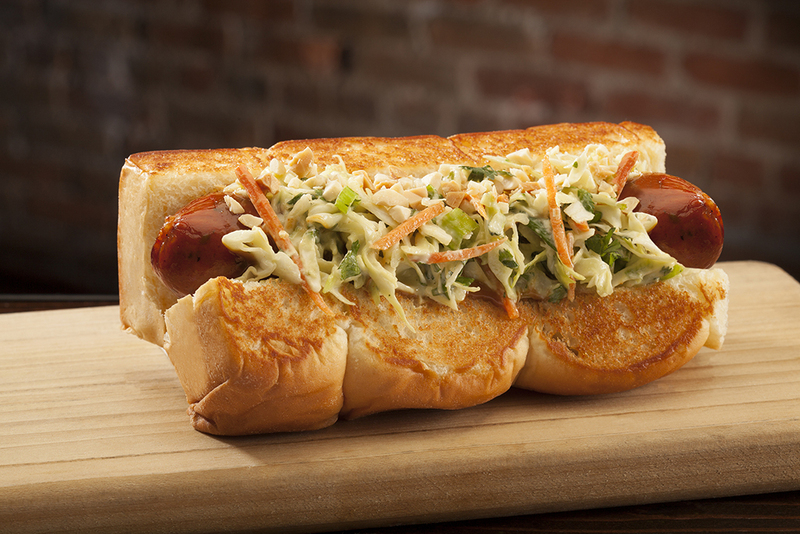 There’s a full list of dogs and burgers (give a raise to whoever named the Scott Baioli), but a sausage is calling. 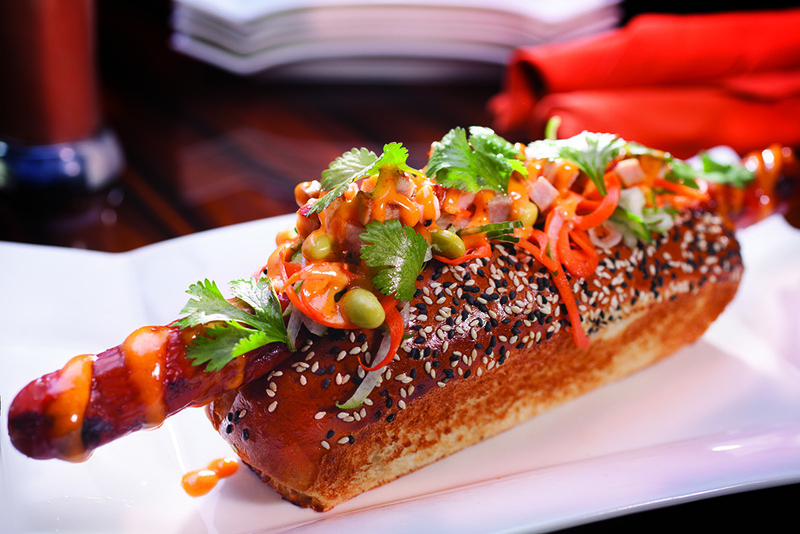 The Another Night in Bangkok is a spicy Thai currywurst topped with peanut sauce, slaw and crushed peanuts.